Would you listen to D-Day again? Why? No. I have been listening to audio books for at least 25 years and I have never listened to a book twice. I'm not going to start now. What was one of the most memorable moments of D-Day? 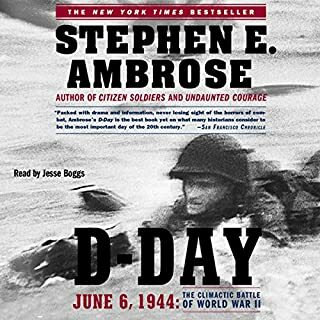 I have read a variety of accounts of D-Day including several books but Ambrose was the first to tell the story of the destroyers which followed our soldiers to Omaha Beach and laid down five inch fire using the targets of the few tanks that made it ashore as guides for fire missions. In the Ambrose version, had one destroyer captain not seized the opportunity to move as close to shore as possible and lay down fire on the German gun emplacements our infantry may never have penetrated the shingle, the sea wall and the the German defenses. As a result of that captain's leadership four or five more destroyers fell in behind his ship and lay down covering fire and fire on specific objectives all without the use of one beach to ship radio. All the radio equipment carried on shore by the infantry had died by drowning in the surf. The Navy watched at first in horror and then one man reacted changing the entire situation. One whale of a story. The Omaha Beach destroyers without doubt. I don't think I understood just how ill General Teddy Roosevelt was. Ambrose makes him a character more than a great warrior. Nonetheless he walked with his cane all over Utah Beach organizing some and encouraging a lot without regard for enemy fire. As a result Omar Bradley when asked what courage was said, something to the effect, "Courage was Ted Roosevelt on Utah Beach." I now know something about the Canadian contribution to D-Day.